We are not made of mere skin and bones; we are a collection of memories, beliefs, ideas, and special attributes that make us who we are. Our bodies have special centers where all this information is stored. These centers are called chakras. Chakras each have their own meaning and function that is tied to emotional wellbeing and physical condition, too. Most people aren’t aware of their chakras, let alone tend to them. Now I’m sure you’ve seen pictures with the body and the colored notation depicting where the chakra sits in the body, but perhaps you haven’t given it much more effort or thought than that. And that’s ok because tending to them is still a viable option even if you don’t know the first thing about them. When we get down to it, our body is made of cells which are made of atoms which are made of pure energy. This energy composes our physical body but all our spiritual or energetic body, too. My experience of studying, using, and experimenting with energy work over the last nine years has brought me to this current point in time where I am sharing with pregnant moms or those will little ones born after 8-8-15, effective and easy techniques for working with their energy. I wish that women took as much care and concern over their energetic body as they did their physical one. There is an obsession after pregnancy to bounce back to pre-pregnancy shape. There is plenty of room in our outlook to be concerned over our wellbeing in ways that are less obvious to the naked eye. Moms, it’s time to be concerned with the wellbeing of our energetic body. And I’m talking about more than just symptoms of stress and anxiety. We need to tend to the beliefs, memories, values, or patterns that are stored in our bodies that no longer serve us. Can you relate to any of these thoughts? This is the tip of the iceberg, the list can go on and on for things that we believe with or without justification. I hope you can self-identify some similarity in your own body to these that are commonly shared among many women (you aren’t alone). There are many ways to tackle being better equipped to manage, handle, come to peace with, or deal with the emotional baggage of this belief. You could read self-help books, see a therapist, talk to your spouse, seek the comfort of your siblings, take prescriptions; the list is long for ways to resolve it. The problem is that all of these assume the logical mind or emotional heart are the only things at play here. They are not. The energetic body is completely present. In this example, the mother may hold on to a lifetime of memories of seeing her mother be impatient with her triggering a host of emotions—inadequacy, insecurity, anger, loneliness, guilt, embarrassment, etc. Our bodies have recorded those images and associated feelings each time we experienced that OR relived the memories. Those recorded stories live in our energy systems creating a mess of caked up back-log of energy. With a body full of past painful memories, we feel stuck and helpless. When you feel these two specific emotions, it shows up in the present through many ways like disinterest, annoyance, frustration, emptiness, lack of physical energy, jealousy, or resentment. 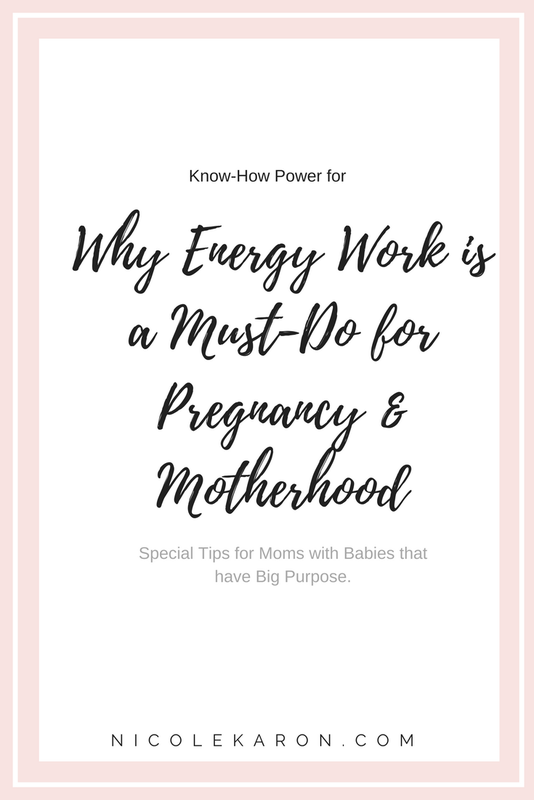 So in context of being a new mom, having energy work done on you or by you is so very important because you are in a new chapter of life where things are unknown. If you are carrying around that old energy and using it to look at your new situation, you are likely to experience déjà vu; old patterns will remain and you will not be able to create the life for you and your baby that you so desire. Real change comes at the energetic level, not the intellectual or emotional level. We need to release old ick, opening up space in our new mom bodies to properly process experiences. Ever notice how jaded you feel over something that is seemingly sweet? You are using old energy to process this new experience and it makes you see things through a tainted telescope negatively affecting what you feel. Imagine what it would be like if you didn’t have those blocks—those limitations on your viewpoints or experiences. Imagine what it feels like if you could just observe without judgement and take the experience in for what it truly was saving yourself mind chatter that ultimately drains you. It’s a very special change that occurs as we step into motherhood. It is a new identity, purpose, and brings a new role to our lives. Whether you became a mother by accident, surprise, or choice, one thing is clear: along the way of transitioning into it, your energetic makeup changes and it’s necessary to start clearing it out so that you can be all the mom you desire to be. Clearing out your energy is imperative for your little one too. They need you to be energetically clear so that you can see opportunities, choices, and experiences without baggage to make the best possible decisions for them. Being energetically clear also means you are better able to listen to your own heart and intuition (or momma instinct). When you change your energy, you change your patterns and therefor allow your little one the opportunity to create their own patterns rather than get your old-hand-me-down ones that have caused you pain, frustration, or disservice. Take walks and repeat “I release anything that no longer services me” over and over aloud or to yourself. My preference is aloud—the sound vibration is healing too. Walk as often as you need to with this intention--multiple times a day, every day, or as often as you feel like you need to (trust the answer, don’t doubt yourself). Eat more foods with life and vibrancy. Consume more foods that are alive to take in their energy to raise your own vibration. There are lots of recipes out there to make vegetables and fruits that are honestly very good. Start with something and keep adding to your repertoire. Sort through a mess. Go through a drawer, dresser, box, purse, car, baby bag, etc. Throw away garbage and if it’s worth keeping (you can easily say “Yes, I love this”—if not, get rid of it), find it a proper home. If you are planning on donating items, know exactly where you will take it and when you’ll do that. Otherwise, it will become new clutter. Starting with these three techniques will begin to get your energy moving a little and give you the resources in space and power to keep clearing your energy more deeply feeling more confident, satisfied, and whole. For help clearing yourself out, you can join my "Mommas Healing Group" where each month we focus on a new healing that helps clear things out and call in for something better. If you can follow along to someone rattling off a recipe, you can do my energy work. You'll have access to the healing and can do it when the time is good for you. We begin on November 1, 2017.